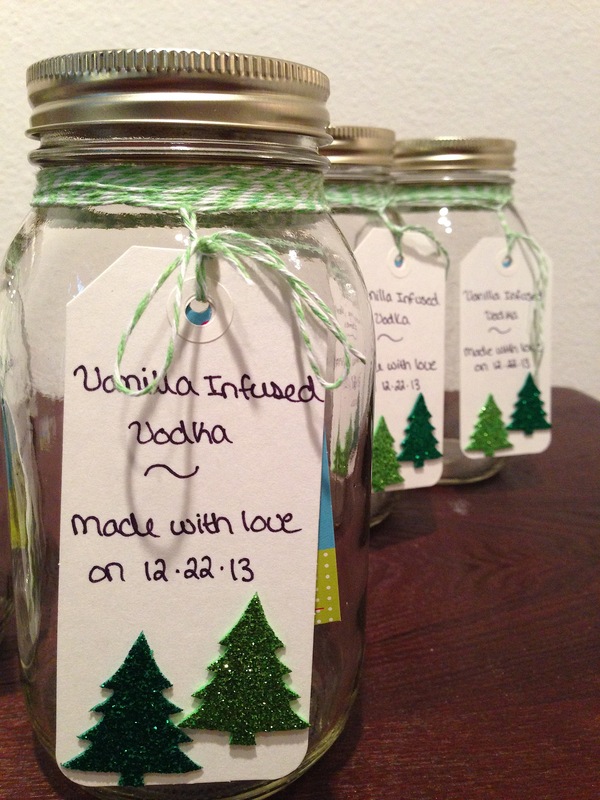 Today I’m sharing a DIY gift that I made for some friends for Christmas. Infusing vodka or any booze is pretty easy – you just add ingredients to an alcohol base until it achieves the flavor you like. There are some pretty detailed instructions and recipes all over the web for infusing alcohol (even one on how to infuse using Halloween candy yikes!) but I decided to keep things simple for my first recipe. 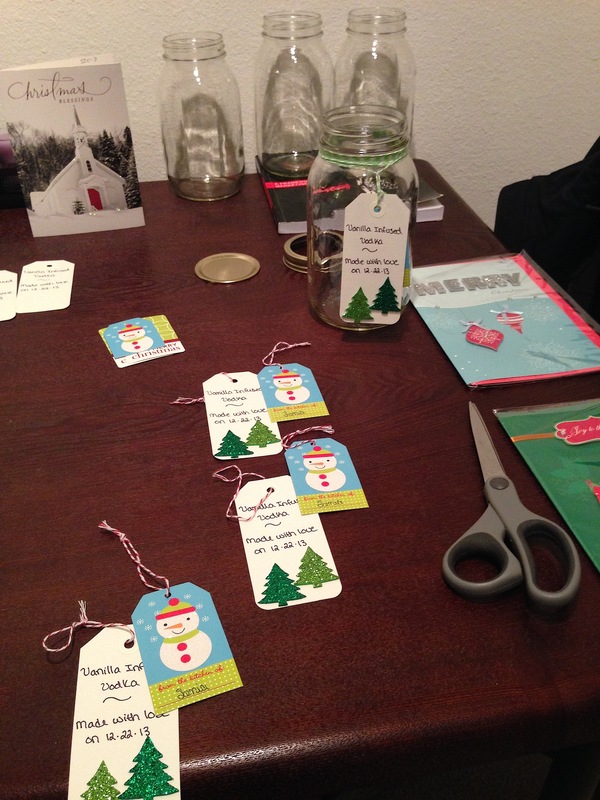 Said cute tags and ribbons, string and holiday-themed stickers (this is completely optional). Glass jars with lids. I bought Ball jars at Michaels, but any jar with a tightly closing lid will work. Smirnoff vodka. I chose vodka because it has a neutral flavor and it was the recommended liquor for beginning infusers (that’s me!). I also read that it’s recommended to use a middle-shelf liquor for this because, like cooking, if you begin with a low quality ingredient, you will end up with low quality product. And there’s no need to spend the cash on a super-smooth, top-shelf vodka that you are just going to change the flavor of. Hence the Smirnoff. 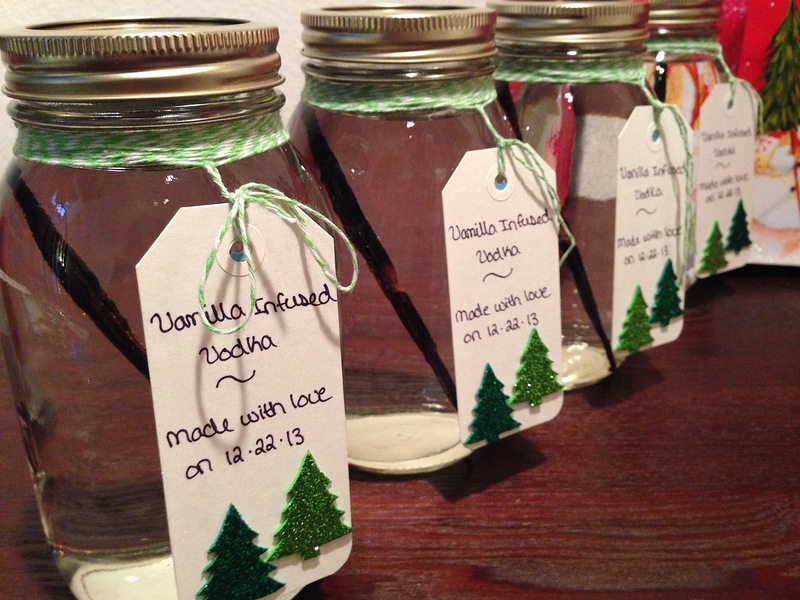 Since it was the holiday season and the other part of my gift bag included some fancy sipping chocolate, I stuck with the theme and chose vanilla as the flavor to infuse the vodka. The beans used are Madagascar vanilla beans from Trader Joe’s (quite possibly my second happiest place on earth). You can choose almost any ingredient to flavor your vodka; pineapples, chai tea, cucumbers, star anise, etc. The possibilities are virtually endless. If you’re feeling creative, Bon Appetit has a good infusing article to help you find new flavor combinations. Here’s how to put everything together. 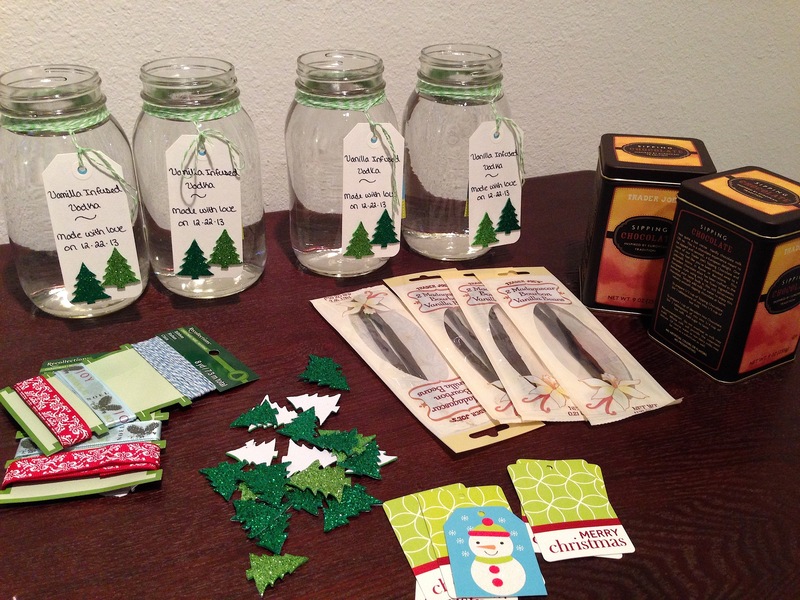 First I created some tags using the stickers and tied them to the jars with striped string. One the back of each tag I included some tips on how long to allow the vodka to infuse (1-2 weeks), shaking gently daily, and straining it before use. Then I washed and dried the jars and lids and divided the vodka evenly among them. I had four (32 oz) jars so I needed two 175 mL bottles of vodka. 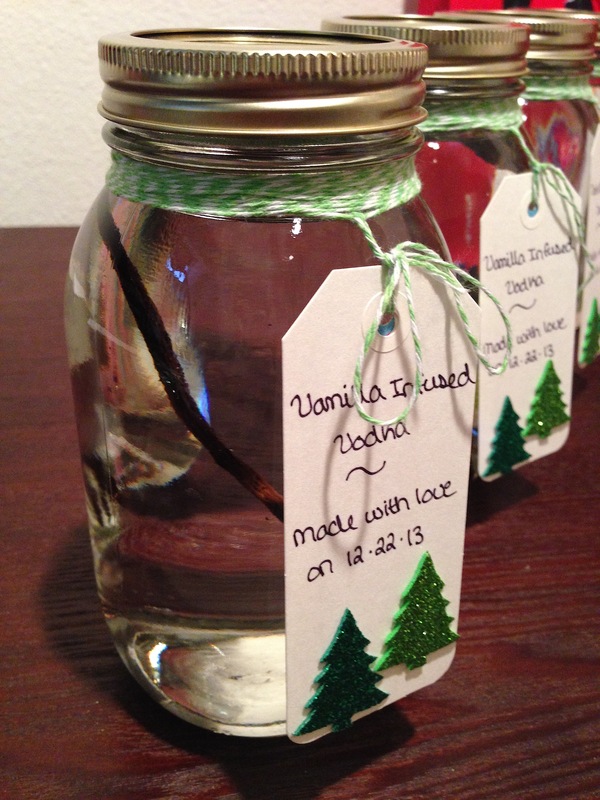 I split one vanilla bean and added it to each jar and closed the lid very tightly. To complete my gifts, I put the vodka into festive gift bags with the sipping chocolate and topped off with some tissue paper. At this point, I can strain and and it’s ready to use. 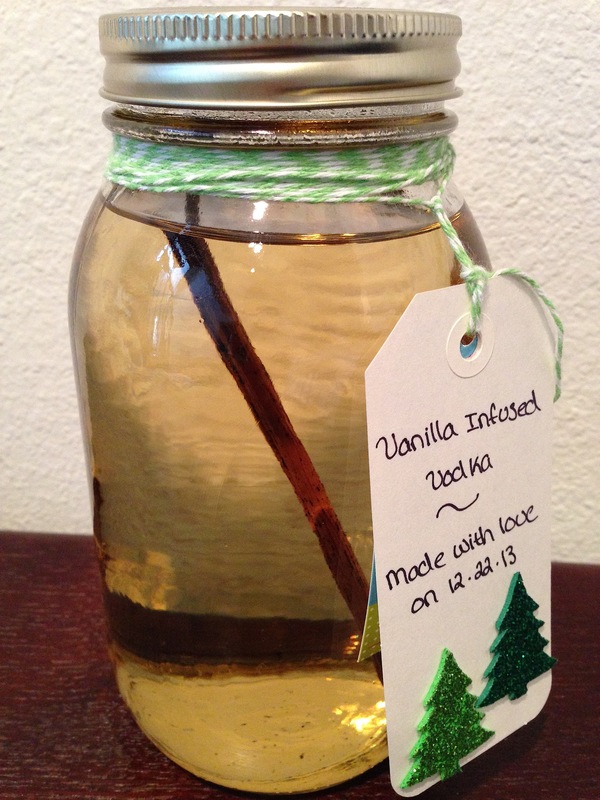 I plan to make a Ginger Vanilla Vodka-tini for my first drink using my homemade vanilla infused vodka.